My two nieces and a nephew are here today and we all went for a walk in the forest (11 of us). It’s a preliminary fall type of day, bright and clear and dry. Contentment in my heart. Sunshine in our smiles. I brought home nature bits in my hand. Naomi had the first find; a tiny feather with an orange tip. She ran to me and I said, “Oh can I keep it?” and she jumped up and down smiling, “Yes!” Then, I found a blob of a yellow mushroom oozing out of a fallen tree. I was surprised by the color and kept it. Then, another feather! I have a nature journal and I glue feathers into it. 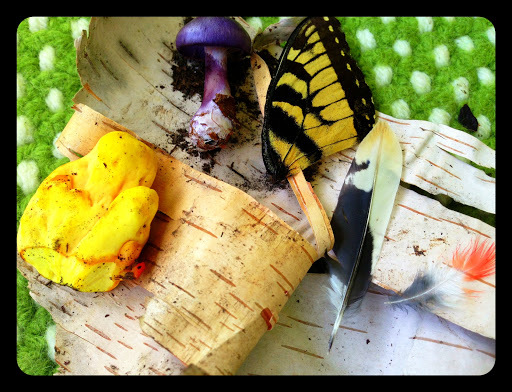 I have never seen feathers like the ones we found today and can’t wait to add them to the journal. A purple mushroom and a butterfly wing. Strangely, just a single wing. Yellow mushroom ooze…. yikes! It looks rather like a smashed peep (candy)! I like that feather! Such treasures you guys found. And how lovely to have woods to walk through. Love your property!